Value Ideas Blog» Blog Archive » METKA S.A.: One of the cheapest companies in the world? Home » General » METKA S.A.: One of the cheapest companies in the world? This leaves us with an upside of 56% of today’s share price if we calculate with the net EPV. Nevertheless we do not invest due to ethical and corporate governance concerns. Metka SA was founded in the year of 1964 and is an EPC contractor, primarily focused on the delivery of complete power generation plants. METKA carries out such projects either as a main contractor, or in consortium with leading power generation equipment manufacturers. Under an EPC contract, the contractor designs the installation, procures the necessary materials and builds the project, either directly or by a sub contractor. In some cases, the contractor carries the project risk for time overrun as well as budget in return for a fixed price, called lump sum LSTK depending on the agreed scope of work. The company also manufactures complex metal constructions for a range of applications in the energy, defense and infrastructure sect. It was floated in the year of 1973. In 1999 Chairman and CEO Ioannis G. Mytilineos joined the company. In 1982 Fillipos Zotos joined the company as CFO and is in place since then. Ioannis Mytilineos is a son of the Mytilineos family which is in control of the mother company of METKA which is called after them. Mytilineos was founded in the year of 1908 and is publicly listed since the year of 1995.The main activity of Mytilineos lies in the metallurgical and trade business. METKA started as a state owned manufacturer of metal constructions in the year of 1964 which has created the name of it (Metal Constructions of Greece S.A. or “Metallikes Kataskeves Ellados AE” in Greek). Since then it’s headquartered in an outskirt of Athen. In the year of 1971 it was privatized and IPOed in the year of 1973 after it carried out first international projects. In 1980 the company absorbed the technical contracting firm TECHNOM S.A. thus acquiring the capacity to build and assemble items at an industrialized level and obtaining the ability to undertake and implement large scale public works. In 1989 followed the acquisition of the “Hellenic Steel Process Industry” (Servisteel) and with its modern automated equipment, METKA could start industrializing metal works (blasting, cutting, drilling).After 39 consecutive years of operation, METKA opens up to new areas of activity such as: energy, defence, renewable energy sources, exports and refineries. During the period of July 1998 through to January 1999, Mytilineos gradually acquired a controlling interest in the company and in early 1999 the acquisition was officially completed. 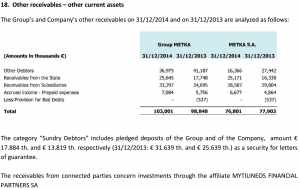 Currently the Mytilineos Group owns 50.4% of Metka. In December 1999, METKA proceeded to a 40% share acquisition of EKME. The company deals mainly with the design and construction of units for petrochemical and power production plants. In 2006 METKA acquires ELEMKA, a company specialized in civil engineering applications. From that base the Mytilineos brothers (Ioannis and his brother Evangelos Mytilineaos together own 31.8% of Mytilineos Group) build this business into a competitive engineering, procurement and construction business (EPC). Since the takeover METKA’s main business activity is in construction of large power generation plants, most notably highly efficient combined cycle power plants. The company also has significant industrial manufacturing facilities, which enables it to produce specialized mechanical equipment, fabrications and machinery used in industrial and defense applications. METKA is active in three segments. Most importantly it builds utility plants for electric power operators, infrastructure business and a defense business. At this time the utility plant engineering and contractor business represents more than 90% of revenues. EPC accounts for the biggest part of the revenue and stands for nearly 90% of generated EBIT. Defense stands for the business of constructing and delivering of semi-trailers and launcher platforms of the Patriot PAC-3 system. Furthermore 62 turrets for Leopard 2 Main-battle tanks are constructed. 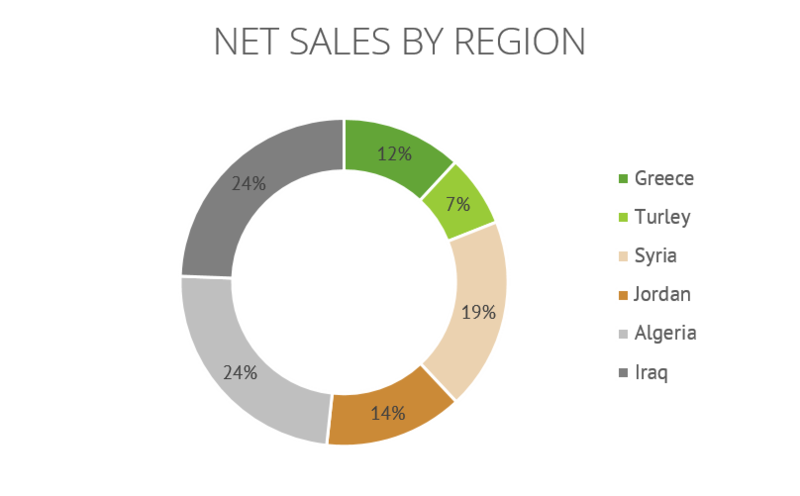 It accounts for just 4% of revenue but generates more than 7% of total EBIT. The share of infrastructure revenues will increase over the coming years due to the signed contract over a new railways project of the state owned Greece rail operator ERGOSE which amount to EUR 220 million. 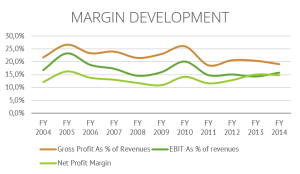 The EBIT margin is an assumption based on the annual report, management interviews and the EBITDA estimates of third party research. The exposure to Iraq will vanish in the new annual report due to the sale of the project to the Joint Venture Partner SEPCO 3. The project was sold with a profit in the last year due to the high uncertainty in the region of the project. The overall exposure to Greece will increase in the following years due to the secured railways project (EUR 220m.). You can se the development of the margins below. The binding bid for the privatization of the country’s regional airports in a JV with Corporacion America failed at the end of November 2014 when Fraport was awarded preferred bidder. The tender consists of 14 major regional airports and another seven smaller ones that will be tendered in two clusters. Under the tender’s terms the contractors will undertake the operation of the airports for 30 years with an option for another 10 years and the possibility for a further extension if there is sufficient interest. Contractors will also have to implement investments in the infrastructure of airports for the first three years, estimated reportedly at EUR 250-300m. The aim of the bid was to diversify METKAs revenue streams away from the erratic EPC business. I think the Fast Track Power Plants are one of the most interesting business field of METKA due to their unique selling proposition and with this lower competition from other project developers. The production of complex military equipment in license is highly profitable, the production of Patriot & Turrets acounts for 3.2% of revenue but genearted an EBIT Margin of > 40%, but is strongly related to overall political decisions. As it is clear to everyone METKA is an execution only business but nevertheless METKA is able to compete through the really strong focus on execution and the possibility to provide its service in remote areas. The ability to provide a fast track power plant is the key to establish a long term customer relationship and get awarded with the following contracts for a fixed power plant. With this excess METKA is able to avoid the typical tender offers and can earn a favorable EBIT margin of over 15% on its projects. METKA operates mainly in remote environments which lead to the fact that they are sometimes the only bidder for a tender or that the biggest contractors like Alstom or Siemens stay out of the market by themselves. Furthermore METKA has adapted to these hard environments and is able to execute the projects in time and budget. It seems like, that other EPC companies don’t like to go in such funny countries which is why METKA is able to charge a premium. With its utility engineering and contractor business METKA is focused on building Combined Cycle Gas Turbine Power Plants, Simple Cycle Gas Turbine Power Plants and Mobile Gas Turbine Power Plants. The company also has prior experience in building Conventional Thermal Plants (mostly Lignite) and Hydro Power Plants. Most of the focus now is on CCGT (Combined Cycle Gas Turbine), SCGT (Single Cycle Gas Turbine) and fast track projects like Mobile Gas Turbines. Fast track is important as fast growth in demand for power often requires fast turnaround times. Fast Track Solutions can provide energy in weeks and are easily movable. This is possible due to the own development of METKA which enables them to construct a complete power plant into several different parts which are built into standard containers. METKA benefits with this from the need to rapidly expand capacity and that this is need is more important than the most efficient way of producing electricity. METKA Sells fully mobile power plants, the ownership lies in the hand of the customer. Aggreko Rents out generators which get as big as a container, which can produce energy, heat and cold for events for fixed time periods. APR energy installs and commissions a power plant (mostly diesel) within 30 days or less. According to several sources METKA is extremely focused on its EBIT margin. They tend to start the project calculation with a 20% EBIT Margin and add up all other costs. This is a possible explanation for the high stability of METKAs EBIT Margins. We also heard that other companies aren’t so strict with their pricing and that they tend to apply EBIT Margins of less than 6% for a project in Algeria. Furthermore METKA only sells its projects for fixed prices, which generally allow for higher margins. Additionally METKA has built a good reputation for finishing projects on time and within budget which is not always the case for huge projects like a power plant. This was confirmed by RWE and OMV for whom it finished two separate and large projects in Turkey in 2013 and employees of GE and Alstom from which it sourced a bulk of equipment and turbines. According to our sources all payments where in time. 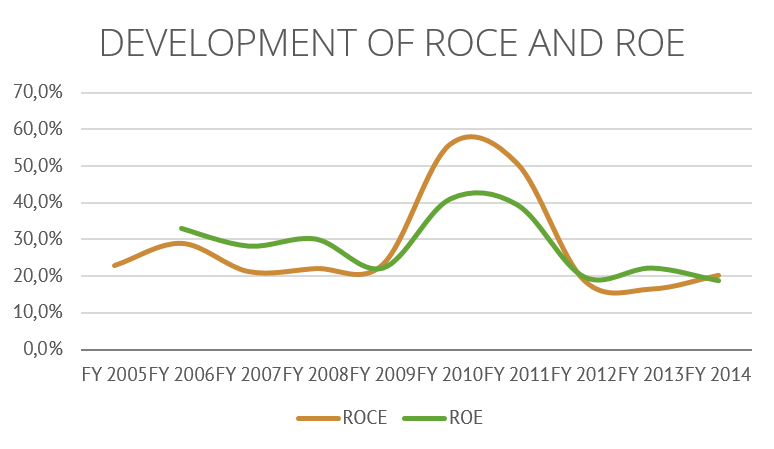 In the Chart below, you can examine the development of the ROCE based on the generated NOPAT and the ROE. The market for EPC contractors is quite crowded in most parts of the world but METKA tries to create its own niche by focusing on the MENA region which we can also call, “Funny Countries”. 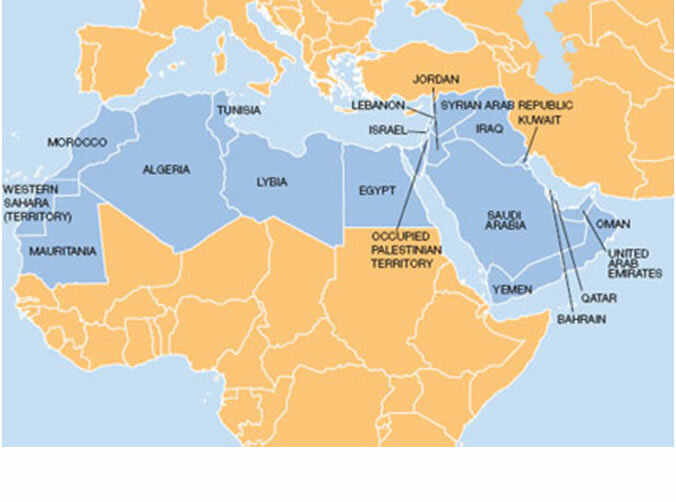 MENA stands for the Middle East and North Africa. METKAs future growth is therefore mainly dependent on this region. MENA has a fast growing demand for power and additionally large amounts of natural gas. The expected future demand growth is mainly driven by the growth in population, the median age of the population and increased GDP per capita. All the countries in MENA area are expected to see significant and continued increases in population for the next few decades. Additionally adults use a lot more power per person than children which will in combination with the future rise of the median/average age lead to a further increase of energy demand. One example for the future opportunities is Egypt, where the median age is around 25 years old. 75% of the population is 40 years old or younger. In addition, North Africa and the Middle East do have reasonable potential for GDP per capita growth. If we assume 2%-3% per capita GDP growth in addition to about 2% to 3% demand growth due to population growth, then it is easy to see a need for a lot more power generation in the region. The compounding demand growth of 5% per year over 15 years leads to doubling of demand. A further point of interest is the lack of stable capacity to supply current demand. 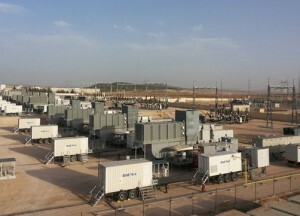 Iraq with all its political problems is currently investing in additional generation capacity. As stable electricity has a huge impact on the quality of life, electricity tends to be a big priority for every government in the MENA region. For example in Iraq needs to add more than 70% net power generation to satisfy its peak demand. Over the period to 2035, Iraq needs to install around 70 gigawatts of generation capacity and move away from a predominantly oil-fired power mix to more reliance on efficient gas-fired generation: without this transition, Iraq would forego around $520 billion in oil export revenues and domestic oil demand would be more than 1mb/d higher in 2035. Another example is Algeria where Peak power demand has been growing by 5-6% annually for several years, and growth is expected to accelerate to 10% a year up to 2020. According to the regulator Consumption is expected to double from a projected 75-80 terawatt hours (twh) in 2020 to around 130-150 twh by 2030. An additional driver is the fact that peak demand has come historically in the winter months, but the wider availability of air-conditioning means that summer blackouts are becoming a more frequent problem. Power demand hit a July peak of 9,463 mw in 2012 (up by 13%), according to the state power company, Sonelgaz. Power cuts in the summer of 2012 resulted in protests during which demonstrators blocked roads and clashed with security forces, and Sonelgaz was forced to ask consumers to moderate consumption. We think that Algeria was and will be a major business opportunity for METKAs “Fast Track Offerings”. This is also shown in the latest round of tenders where the government revealed plans to increase electricity generation capacity by 8,000 mw (to 19,000 mw), although the target date has been delayed from the original 2016 deadline to 2017. As you can see from the graph below, the total power consumption of MENA countries is significantly below that of advanced countries by multiples. A decent part of that demand is naturally also related to industry in developed countries, but we still see huge gaps. Much of the additional demand for power in the MENA region will be supplied by gas powered plants as the region has an ample supply of natural gas which is much cheaper than exportable oil reserves. Additionally this demand is forced to get full field in time due to the social unrests in the regions which where expressed in the Arab spring. Currently the company has contracts ongoing in Algeria, Jordan, Syria. The project in Iraq was sold to the Joint venture Partner recently due to the lag in risk reward perspective. Turkey was and will be an important market for METKA too as two large projects was finished in the year of 2013. Interestingly METKA was able to win the tender despite the presence of major established competitors like Alstom. Through interviews with the Management and Alstom employees we know that the big players normally try to sell the power plant with a razor blade thin margin to gain the highly profitable after sales business. As Alstom was the favorite supplier of the Turkish government, METKA was able to win against these major competitors on their home turf and was able to make a good profit. METKA has competitors in the EPC market. One of the closest competitors of METKA is Conduril, which conducts public engineering and construction projects. The company construct dams, bridges, highways, roads and sentient infrastructure as well as provides the dramatic works, groundwater and cute technical works. Conduril offers its service in countries like Mozambique, Botswana, Spain, Senegal and Zimbabwe. It is currently trading at an EV/EBIT 2x and EV/Sales 0.63x. The majority of projects in the EPC business are tender offers, where the construction of a project is announced and needed specifications are set by the state. Afterward different contractors bid for the construction of the project. This competitive bidding process leads normally to an overall lower profitability of EPC contractors, which stands in a wide discrepancy to the historical EBIT margins of METKA. We have heard from a various sources, that METKA is really prudent in terms of the pricing of its projects. According to our sources, METKA normally starts its calculation with an EBIT margin of 20 % and then add up all additional costs. With this approach that they rather abandon a project and future revenues and only stick to highly profitable projects. We see this behavior really positive and it is in line with the approach described in the wonderful book the Outsiders. A further interesting point is, that METKA was and is able to bypass some tenders by getting directly awarded as a project partner. One example for this was that METKA was able to win the first tender contract for a Fast Track Project and was latter awarded with a follow up contract which was not tendered at all. To achieve something like this, you need satisfied customers and/or a good network in the region. The major part of capital is bound in the Working capital of METKA. In more detail, it lies in the huge amount receivables, which is typical for a project based business. Most of the money is related to milestone payments, which are booked on restricted accounts of different banks and switch owners when the milestone is completed. This bounded capital is something which we already know from Aggreko and where we have seen, that it can happen that decision maker change their mind and a deal is canceld over night. Furthermore, the feasibility to obtain a high percentage of the WC when a deal is cancelled, is rather small. Current management around Ioannis Mytilineos took over the business at the start of 1999. 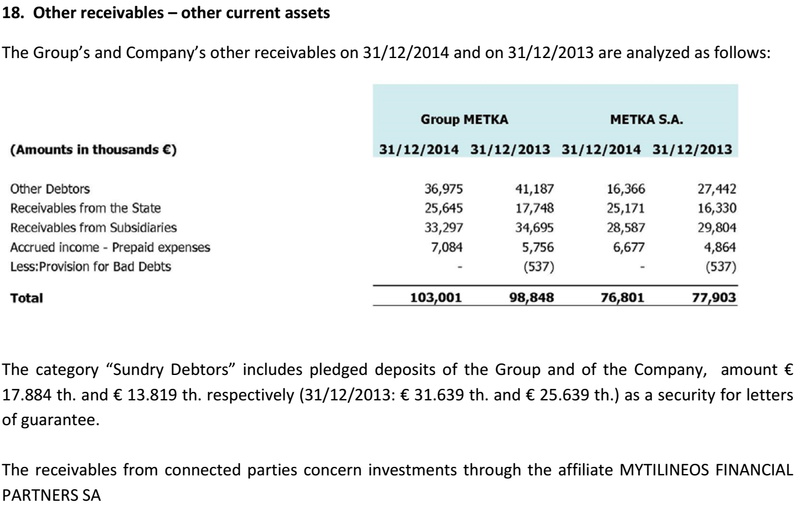 To this time METKAs business was entirely focused on Greece with revenues of €45.1 million and profits of €2.1 million. At the end of 2014 revenues were €609 million and profits were €90.3 million. Since the year of 1998 the revenue will of METKA has grown 18.9% per year and profits went up even faster. Also since 1999 through 2014 management compounded cash adjusted book value per share by 15.9%. At the end of 1999 cash adjusted book value was €1.78 per share. In 2015 cash adjusted book value per share was €15.48 per share. Cash adjusted book value adds back all the cash management paid out to share holders over that period. Despite going through the Greek financial crisis, which started in 2008, the business increased its cash adjusted book value per share from €5.5 per share at the end of 2007 to now over 15 Euro per share in the year of 2015. The stake of the Mytilineos Group is a little bit higher and amounts to 50.4%. George Pallas: Born in Salamina, Piraeus, in 1956. He is Mechanical – Electrical Engineer Graduate from the National Technical University of Athens. Member of the Technical Chamber of Greece. He has been employed in the Company in 2000 and is a Non-executive Member of the Board of Directors of the Company. Fillipos Zotos: Born in Athens, in 1953. He is General Manager of Financial and Administrative Services and non – executive member of the Board of Directors of the Company. Civil Engineer Graduate from the National Technical University of Athens. He has been employed in the Company in 1982. Nikolaos Bakirtzoglou: Born in Nikea, Attiki, in 1945. He is a non-executive Member of the Board of Directors of the Company. Mechanical – Electrical Engineer Graduate from the National Technical University of Athens. He has been employed in the Company in 1972. Iosif Avagianos: Born in Mitilini, Lesvos in 1946. He is an Independent, Non-Executive member of the Board of Directors of the Company . He holds an MSc degree in Metallurgy Engineering and he is a graduate of the National Technical University of Athens. He served for 30 years as a Senior Executive in the Industry being Responsible for the Planning, Installation & Operation of Industrial Units’ Production. What concerns me is that they are all company insiders and all of the same age, which opens in my opinion the potential for bribery/fraud. We have spoken with the executive board member Paul Smith who is originally from Great Britain and the only foreign board member of METKA. Ioannis Mytilineos Chairman & Managing Director: Born in Athens, in 1955. He is a graduate of the School of Engineering of the Aristotle University of Thessaloniki (Department of Civil Engineering). He is Chairman and Managing Director of METKA S.A. He was also a co-founder of MYTILINEOS HOLDINGS S.A., and has been serving as the Company’s Vice-Chairman since its establishment. George Economou Vice President: Born in Volos, in 1949. Director of the Company’s Plant in Volos and executive member of the Board of Directors of the Company. Mechanical Engineer Graduate from the National Technical University of Athens. He has been employed in the Company from 1977. Panagiotis Gardelinos Deputy Managing Director: Born in Athens, in 1961. He is General Manager of projects and executive manager of the Board of Directors of the Company. Mechanical Engineer Graduate of the National Technical University of Athens. He has been employed in the Company in 2006. Christos Pantzikas Executive Member: Born in Athens in 1969. He is General Manager of Engineering & Commissioning and executive member of the Board of Directors of the Company, graduate from National Technical University of Athens with a major in Mechanical Engineering. He has been employed in the company since 1999. Ekaterini Donta Executive Member: Born in Piraeus in 1950, she is Raw Materials and Purchasing Director and executive member of the Board of Directors of the Company, graduate from National Kapodistrian University. She has been employed in the Company since 1998. Paul Smith Executive Member: Born in York, UK in 1967. He is the General Manager of Sales & Development and Executive member of the Board of Directors of the Company, graduate from University of Nottingham in UK with a degree in Mechanical engineering and a major in Chemical Engineering. He has been employed in the company since 2006. The Board of Directors received a 3.6 million Euro payment as fee for their services on the board which I think is quiet lavish. 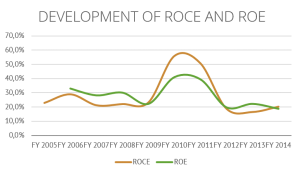 The Key Performance Indicator for METKA are ROCE, ROE and EVA, which we think is quite positive. Due to the fact, that return on capital employed and return on equity takes the bound capital into account the management is incentivizet to run the company in a lean way. This should incentivize the management to pay out excess cash to shareholders. What is a steady state EBIT Margin? What is the potential growth in the future? As we have seen that METKA is really focused on its EBIT margin we think that they will sustain the current 15% EBIT margin. The potential growth of METKA is closely related to the overall growth and demand of electricity in the MENA region which is expected to be very strong in the future. Nevertheless I assume no growth at all for METKA in the future. In the recent earnings call METKA has shown the ability to replenish its backlog with small scale projects. One example for this is the not yet announced project in Ghana which has an overall value of 250 million dollar from which 70% is related to METKA. This leads to an backlog increase of 150 million euro. Since 2012, METKA participates in the cash pooling of the Mytilineos group though the subsidiary Mytilineos Financial Partners which invest in the corporate bond market. This investments amounted to EUR 17.88 and 13.82 million in December 2014 which is classified under IFRS as a receivable from connected parties. In our opinion this money has to be treated as cash and cash equivalents which increase the net cash at hand further. The total true cash balance available at the end of December 2014 was €392.6 million (€7.56 per share). At a Share price of 8.85 the Marketcap of METKA is 450.4 million, which translates itself to an EV of 57.763 Mio. EURO. In the year of 2014 a revenue of 609.0 Mio. was genarated, which translate itself to an EV/Sales of 0.09x. If we assume that METKA is able to maintain its current backlog and will not lower its overall hurdle rate for projects, I think a sustainable EBIT margin of 15% is realistic. 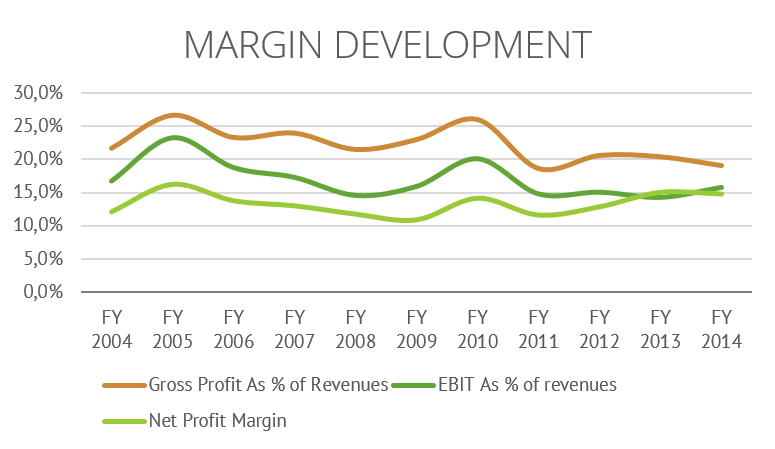 You have to keep in mind that the current EBIT margin and the average EBIT margin over the last 10 years were 17%. At an EBIT Margin of 15% this would translate itself to an EV/EBIT 0.6x for METKA. Nevertheless we think that there is a potential, that due to the new business which is conducted in Greece the margins are further negatively effected. But to simply assume this, would be foolish and we try to explain you why. As we know that METKA is an EPC company, it receives some upfront payments from its customers, which amount to 206 million on the Liabilities site. So to be conservative, we subtract this amount from the cash at hand which leaves us with 187 million Euro (€3.6 per share). Additionally we would like to mention that if we do something like this, we have to take the net working capital into consideration as well. The NWC of METKA alone was €267 million (€5.14 per share) at the 31.12.2014 and mainly consists of receivables of €305 million. Notable here is, that the mother group owes a huge amount receivables which are already due over a year. Confronted with this, the management actually told us, that this was due to balance sheet and covenants considerations of Mytilineos and as METKA don’t need the money they think this behavior is okay. If you add up the €3.6 from before and the €5.14 you and up with €8.74 which is close to today’s share price but we will leave this a side. Furthermore METKA has to make high upfront investment into project and for this reason we will assume that the current business needs around 10 % of revenue as cash which is around 60 million. To put it in nut shell and leave out the NWC METKA has around 127 million (€2.31 per share) hard excess cash or €7.45 “soft cash” per share. As there are active letters of credit in place guaranteeing payment based on progress for all of METKAs projects the actual Backlock seems to be fully valuable. This also impose some costs on it which you can find in footnote 34 point Letter of Credit commissions. The costs totaled over EUR 10.1m. in the year of 2013 and we think are more like an operating expense for METKA as it tries to avoid credit risk. There are plenty of markets where METK can expand into. The next most logical choice is central Africa where it was already assigned preferable bidder for the construction of a power plant in Ghana. Central Africa has very good fundamentals going forward, being a very young population with the median age in Africa being less than 20 years old, and fast population and GDP growth. Africa currently has a population of 1.1 billion people growing annually at a conservatively projected 1.5%. In 10 years that gets us to a population of 1.28 billion people in 10 years and 1.48 billion people in 20 years. Also know that the median age being below 20 means the number of adults will explode and adults use a lot more power than children. Add to that some GDP per capita growth and suddenly you have demand expanding at 4% to 5%. And there are also plenty of old utility plants that will need refurbishing or replacing. This all means there will be a huge need for more power plants in Africa and Metka has the skills and reputation to execute those projects in challenging environments to a high level of quality standards and on more importantly quickly and in time. As there is the possibilities for grexit at the moment, we have to consider what would happen when Greece exit the Euro zone and get an own currency. The creation of a new Drachma would involve a huge devaluation. This could create substantial problems for domestically focused businesses, like for example banks. But not for a company like METKA which has nearly 90 percent of its business abroad and in dollar. So if the New Drachma returns METKA would actually benefit from it. In talks with the management we asked about this and we now know that the benefits will be below 30% due to the fact that most of METKAs employees get paid in on an international level and that the cost base in Greece itself is below 30%. Furthermore we were concerned about the huge amount of cash and the country of deposit. According to the management over 90% of METKAs cash is now outside of Greece on international bank accounts and will be therefore not effected by a Grexit. 3. Corporate Governance with no independent Board and the strong influence of the Mytelineos which already lead to lending money at zero costs via an overdraft of receivables over 1 year. Hi guys, great post !!! Just one question: How did you come up with a discount rate of 12,5% for a Greek domiciled company active in Greece, Syria, Algeria and Iraq ? thanks for your words, as you are one of our idols 😉 it is a honor to hear that. Why 12,5%? Good question, we divide our investments into three different levels of business models and three different sizes. Every combination has its own discount value ranging from around 8 to over 13%. So maybe we under estimate the WACC of METKA but I think it is already quiet conservative. If we change the rate to 15,4% we wold end ab with an EPV of 6,31€ or 1,5€ less than before. Even on this lower basis it is a dirty cheap company. The most appropriate way would be to discount all cash flows of each project differently. But i doubt that it would be worth my time considering that we already know that we don’t invest into the company and the many more annual reports to read ;). So thanks for the great work which you have delivered so far, we think your blog is the best out there! Your reasons at the end have nothing to do with price. Does this mean you would never invest in Metka regardless of price? thanks for the kind Words, we appreciate them. Now to your question, yes the dividend will be increased this year but there is much more capital in the balance sheet which is not used, it was the same thing with STO, and I’m concerned about this due to the already shown behavior of the management. As you can see if you take a look at STO and the recent development of the share price, we were punished in terms of foregone profits when the management declared the special dividend. So at the end its a risk you take and it depends on whether you think that this risk is well priced, in the case of METKA it is probably a quite good risk return case. Your second question, wouldn’t we invest at any price? The simple answer is yes. At Frenzel & Herzing we try to invest in an ethical and sustainable way, therefore we don’t invest in companies which are related to the production of military equipment. According to the numbers METKA is probably one of the cheapest companies, which is not badly managed and also highly profitable but according to our guidelines we will not invest. We both believe that at the end of the day a man is judged on the basis of what he has done, and not what he has said. In this sense you have to decide on your own. Cheers and thanks for your question. – have you raised the issue of corruption with management in your interviews? It seems to play a role in your decision not to invest and I was wondering, what the management has to say about this issue. – have you considered investing in Mytilineos Group? The parent itself has a larger exposure to Greece and is active in energy and metals, which might face different risks than Metka’s EPC business, but an investment through the parent would get around some of the governance and capital allocation issues that you mentioned. Mytilineos also seems to trade at very attractive multiples. thanks for your questions. First, we always try to get an insight into the behavior of the management, we try to get a feeling by speaking to them via phone, meet them in person and we try to get a third opinion. We have and will try to do all of the above mentioned in te case of METKA, but till now we where only able to speak and write with an executive member of the board an the iR-department and got some insights from third parties about earlier behavior.I tried it very hard and it was promised several times to get a direct chat with Mr. Mytilineos but till now, I was not successful. Till now, from what we heard, we have excluded an investment into METKA also from the management perspective and not only due to our social guidelines. But when we get a direct contact and have a new informations to judge on, we will rethink our conclusion in terms of the management. Second, yes we have heard from the Mytilineos Group and as far as i know Fairfax has a stake of % in it. We liked the point of the misunderstanding, that it is a greek company which is actually not really the case, in METKAs share price. We don’t see it in the mother company and the business is not that capital light as we like o have it. So thanks again for your questions and cheers! I do think your approach to determine discount rates could lead to systemical errors. You do not reflect the riskiness of where a company is doing business which IMHO is an essential part of detemining a discount rate. You need to reflect both, local nominal rates as well as political risk, even if contracts are in “hard currency”. If you don’t do this, there will be many and almost exclusively bad surprises down the road. Investors in venezuela, Argentina and Egypt have learnt this the hard way. For me, a case like Metka with a risky business model doing business in the highest risk countries, I would think a discount rate of 20-30% p.a. would be more appropriate. I see your point, we designed the standard for european companies till now we never had something like METKA before because we normally try to avoid over risky companies. I have learned how to calculate the WACC of a company in business school, but till now I prefer the Greenwald approach, but I think it is to strict for a situation like METKA. So I think it is good that you mentioned the point, we will adapt our approach accordingly. For the discount rate it is imho also very important to calculate something like value at risk. If something goes south what will they loose? I don’t know. They have some liabilities to their customers to cancel out. And some insurance at least: […]including accidents, injuries, damage in equipment and force majeure events. All of the above events are most likely to cause delays and in worst-case cease of work. Any such developments would hinder the financial position and results of the Group. In order to address the above risks, the Group proceeds to the 100% insurance against such risks to cover the total value of projects and activities with all-risk insurance policies (Erection All Risks & Construction All Risks), including civil liability, employer liability, machinery, vehicles etc to renowned international insurance firms. There is no more information about the insurance. But at least there is some, which should lower the discount rate. The halted project in Syriah is a very large part of their backlog and they seem not be able to add enough new projects to offset the backlog reduction. This is could be an important reason for their low valuation. Also the management did not seem extremely concerned about the country risk and mitigation measures in the 2013 annual as they did not even bother to mention it in the Chairman’s message. He rather speaks of the past which always raises a red flag. They might not be open enough with their shareholders to qualify as an investment. I also recommend staying at the sideline and watch. yes this is partly correct, however in the last conference call METKA actually announced a new project in Ghana which is already said in the blog post. This project is not yet included in the backlog calculation. So the backlog shrinkage is not that bad. Why “Exposure to defense manufacturing” it’s a problem ? from my point of view, can be problematic misuse of cash. Also the low price of oil can cause problems for African countries, what do you think ? I would like to say that I’m from Spain and I’m starting on value investing, I really see great oppurtunity to invest in Greece. nice to hear from you and it’s nice to hear that have started with value recently, in my humble opinion it’s a great journey! For us simply because we don’t do defence, drugs, atomic energy, child labor etc. it’s a personal issue. Otherwise you can earn top dollar in the defence business. Yes you mention a good point, otherwise I have read some articles that due to the even lower gas prices the countries are heavily investing into gas power plants. So I think we will see even greater spendings in the near future. One example can be saudi arabia and there current investment program. I wish you also happy gains and a good start in your value investing career! wir schreiben nochmal was zu Cash Flow shenanigans bei Mytilineos. Any news on the project in Ghana? So far no announcement as far as I see. nope, I have written an E-mail to the IR and will update you.